Christ's ordained priests offer Christ to the Father under the appearances of bread and wine. Christ is really and truly present, under the appearance of bread and wine, in every way: Body, Blood, Soul, and Divinity. The Church, as the Body of Christ, offers Herself to God. Each member, as a part of the royal priesthood ("the priesthood of believers") offers his or her own sufferings and prayers, uniting them with Christ's offering of Himself. This includes the entire Church: Militant, Suffering, and Triumphant. Christ is not re-crucified; the Sacrifice of the Mass is unbloody -- after the order of Melchizedek. Christ died once at a finite point in History; but God is outside of time and His offering of Himself is eternal. The Grace Christ offers in the Divine Liturgy and what He offered on the Cross are of the same sacrifice; therefore, in no way can the liturgical Sacrifice be a "repetition" of the Crucifixion. His sacrifice is re-presented ("made present again in some way"). As the Council of Trent put it, "The fruits of that bloody sacrifice, it is well understood, are received most abundantly through this unbloody one, so far is the latter from derogating in any way from the former." The Sacrifice of the Mass is a propitiatory sacrifice, that is, it is made for the remission of sins and for the appeasement of the Father. The Old Testament sacrifices were ineffectual, but the Sacrifice of Christ on Calvary, which the Mass re-presents, is effectual because Christ Himself is both the High Priest and the perfect Victim. 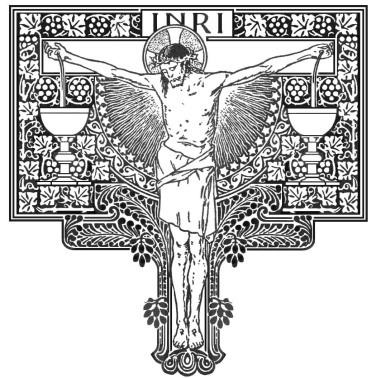 Partaking of His Body (with right intention, as with all Sacraments) remits venial sin and sanctifies. All Christians agree that Jesus Christ is a High Priest, a priest forever after the order of Melchizedek (Hebrews 6:17-20) and that we are members of His royal priesthood, "the priesthood of believers," as Protestants say (1 Peter 2:9-10, Revelation 1:6, Revelation 5:10 , Revelation 20:6). And Catholics, Orthodox, and a few Protestants know that there is an ordained priesthood (the Greek word for "elder" is "presbuteros," which became "presbyter" in Latin and "priest" in English. So whenever you see "elder" in the New Testament, see the word "priest"!). In all these cases, the word "priesthood" entails "sacrifice" as sacrifice is what priests do. The question becomes, then, what is being offered by each kind of priest? The answer is found by looking at how the Old Testament sacrifices prefigure and culminate in the New Testament once and for all time perfect sacrifice made by Jesus Christ on that one day (by Jewish reckoning) from sunset Holy Thursday to sunset Good Friday. Let's first look at Old Testament sacrifices, starting with the enigmatic Melchizedek. What a shadowy figure! He shows up, one time and mysteriously, almost at the very beginning of the Bible -- in Genesis 14, after Abram (soon to become Abraham) rescues Lot from the all these warring Kings. After the rescue, there he comes, Melchizedek, King of Jerusalem and "High Priest of the God Most High" (this is the first time the word priest, kohen, is used in the Bible!). He blesses Abraham (indicating a position of authority), who gave him a "tenth of everything." And what does this High Priest of the God Most High, this King of Righteousness, this man who deigns to bless Abraham offer? Bread and wine. An unbloody sacrificial offering. Who is there even among you that would shut the doors for nought? neither do ye kindle fire on mine altar for nought. I have no pleasure in you, saith the Lord of hosts, neither will I accept an offering at your hand. For from the rising of the sun even unto the going down of the same my name shall be great among the Gentiles; and in every place incense ["Sacrifice" in the Douay-Reims] shall be offered unto my name, and a pure offering ["clean oblation" in the Douay-Reims]: for my name shall be great among the heathen, saith the Lord of hosts. Then the Bible is again silent about Melchizedek until the Book of Hebrews, which tells us that Our Lord is a priest after the order of Melchizedek forever and, in Hebrews 7:11-12, that " If therefore perfection were by the Levitical priesthood, (for under it the people received the law,) what further need was there that another priest should rise after the order of Melchisedec, and not be called after the order of Aaron? For the priesthood being changed, there is made of necessity a change also of the law." Here we can see that the priesthood still exists -- but it is changed and is now after the order of Melchizedek. We know that Melchizedek offered bread and wine. We know that the offering will be pure! [And the LORD spake unto Moses, saying...] And ye shall offer that day when ye wave the sheaf an he lamb without blemish of the first year for a burnt offering unto the LORD. And the meat offering thereof shall be two tenth deals of fine flour mingled with oil, an offering made by fire unto the LORD for a sweet savour: and the drink offering thereof shall be of wine, the fourth part of an hin. The offering was to be flour mixed with oil, and it was to be offered with wine. And thou shalt take fine flour, and bake twelve cakes thereof: two tenth deals shall be in one cake. And thou shalt set them in two rows, six on a row, upon the pure table before the LORD. And thou shalt put pure frankincense upon each row, that it may be on the bread for a memorial, even an offering made by fire unto the LORD. Every sabbath he shall set it in order before the LORD continually, being taken from the children of Israel by an everlasting covenant. And it shall be Aaron's and his sons'; and they shall eat it in the holy place: for it is most holy unto him of the offerings of the LORD made by fire by a perpetual statute. [And Solomon sent to Huram the king of Tyre, saying...] Behold, I build an house to the name of the LORD my God, to dedicate it to him, and to burn before him sweet incense, and for the continual shewbread, and for the burnt offerings morning and evening, on the sabbaths, and on the new moons, and on the solemn feasts of the LORD our God. This is an ordinance for ever to Israel. Thanksgiving Offerings, or "Korban Todah"
And this is the law of the sacrifice of peace offerings, which he shall offer unto the LORD. If he offer it for a thanksgiving, then he shall offer with the sacrifice of thanksgiving unleavened cakes mingled with oil, and unleavened wafers anointed with oil, and cakes mingled with oil, of fine flour, fried. Besides the cakes, he shall offer for his offering leavened bread with the sacrifice of thanksgiving of his peace offerings. And of it he shall offer one out of the whole oblation for an heave offering unto the LORD, and it shall be the priest's that sprinkleth the blood of the peace offerings. And the flesh of the sacrifice of his peace offerings for thanksgiving shall be eaten the same day that it is offered; he shall not leave any of it until the morning. Interestingly, even the Jewish rabbis said in the Midrash that, when the Messiah comes, all offerings will be abolished except the thanksgiving todah offering (Vayikra Rabba 9,2). In the Exodus account of the Passover, God commands the Israelites to take an unblemished, male lamb, sacrifice it, and spread its blood on their doorposts as a sign. They were told to eat the flesh of the lamb that night, with unleavened bread. When He sees the blood on the doorposts, those houses would be saved from having their firstborn slain -- and this Passover was to be kept as a feast as an ordinance forever (since the destruction of the Temple, the paschal lamb could no longer be sacrificed; the post-Temple Jews replaced Passover practices with the seder.). After Melchizedek, one of the most enigmatic phenomena of the Old Testament involves the sacrifice of the red heifer, described in Numbers 19. Outside the city -- and this was the only sacrifice to be made outside the city -- a perfect, unblemished, never-been-yoked red heifer was to have its blood sprinkled seven times in front of the tabernacle, and its body burned along with cedar wood, hyssop, and scarlet, in front of the priest. Then the ashes were to be mixed with pure water and sprinkled over those who are impure because of contact with the dead and for the purpose of purification from sin (Numbers 19:9). I am the living bread which came down from heaven: if any man eat of this bread, he shall live for ever: and the bread that I will give is my flesh, which I will give for the life of the world. The Jews therefore strove among themselves, saying, How can this man give us his flesh to eat? He told what was to come about and then, on that Thursday, He fulfilled Passover, taking bread and wine, after the order of Melchizedek, and saying "This IS My body, this IS My blood." (Matthew 26:26-27; Mark 14:22-24; Luke 22:19-20 -- absolutely parallel in the synoptic Gospels). In Luke 22:20, recalling Moses in Exodus 24:8, He says, "This cup is the new testament in my blood, which is shed for you." He took bread and gave thanks (todah). "Do this," He said, "in remembrance of Me" (Luke 22:19). On that day, this "Lamb of God who takes away the sins of the world" (John 1:29) prepared for His once and for all, perfect Sacrifice. Then He was taken, tried, scourged, and, as prefigured by the sacrifice of the red heifer, draped in scarlet and taken outside the city to be immolated for the sins of the world, hung on wood (cedar? 2) and given vinegar upon hyssop to drink. After His resurrection, He ascended into Heaven where He appears at the Altar of God, as both our High Priest in the order of Melchizedek, and the Perfect Victim -- a "Lamb as it had been slain" (Revelation 5:6). He offers the graces of His once and for all historical sacrifice to us forever, sending to us the "hidden manna" He'd promised (John 6:35, Revelation 2:17). Melchizedek's bread and wine, korban todah, korban pesach, the sacrifice of the red heifer, the Old Testament manna, Malachi's "pure offering" -- all these sacrificial effects, gifts, and prophecies were brought together when Christ instituted the Mass at His Last Supper and then, on that same Jewish day, shed His blood for the remission of sin. At the Sacrifice of the Mass, the Catholic priest offers that same Sacrifice to the Father, and then eats and offers to us the glorified Body of Christ in a form whose "accidents" look like bread and wine after the order of Melchizedek. Calvary is pulled out of time and re-presented before our very eyes! Read again: St. John's Heavenly vision of our Lord, glorified and ascended, is that of a "Lamb as it had been slain" (Revelation 5:6) with an Altar (Revelation 8:3), whence He offers Himself to us in "hidden manna" (Revelation 2:17), the Eucharist. Even in Heaven, the resurrected, glorified Christ, the King of Kings, appears as a "lamb as it had been slain," the perfect Oblation. "In every place..." How can there be predicted pure sacrifice in every place in the New Covenant if Protestant theology is true, if Christ's once and for all Sacrifice is not to be re-presented as it is at the Catholic Mass? In Jerome's (A.D. 340-420) Vulgate, the word that the King James Bible renders "incense" is "sacrificatur," and "offering" is rendered "oblatio." Where in your faith community's worship is incense, let alone, as the true translation reads, sacrifice offered? Most importantly, where is this pure oblation? I've heard Protestants explain this away by saying that Malachi was speaking about "spiritual offerings," but I challenge them to defend their own purity, especially in light of the Calvinist theology of "utter depravity," and Luther's thoughts on our goodness which can be summarized by quoting his, "Be a sinner and sin on bravely, but have stronger faith and rejoice in Christ, who is the victory of sin, death, and the world. Do not for a moment imagine that this life is the abiding place of justice: sin must be committed...sin cannot tear you away from Him, even though you commit adultery a hundred times a day and commit as many murders." Luther and Calvin, the Father and Prince of Protestantism, viewed man as anything but capable of offering God anything pure! Protester, where are this incense and pure oblation offered? This sacrifice is prophecied! Where is it? Are your grape juice and saltines a "pure offering"? Are they pure in themselves? Or do your undoubtedly good intentions and personal holiness make them pure? Are they an offering worthy of God Almighty? And he took the cup, and gave thanks, and gave it to them, saying, Drink ye all of it; For this is my blood of the new testament, which is shed for many for the remission of sins. But I say unto you, I will not drink henceforth of this fruit of the vine, until that day when I drink it new with you in my Father's kingdom. Will eating your grape juice and crackers unworthily make you sick and possibly die? How do you make sense of Paul's words to the Corinthians? "Not discerning" what (say it out loud now!)? What did Paul say the apparent "bread" and "wine" are? If consuming your grape juice and saltines unworthily can't make you sick, then you are not eating what Paul was eating! But "the Spirit quickeneth and the flesh profiteth nothing"! It is the spirit that quickeneth; the flesh profiteth nothing? How can both of these verses be true if understood in the sense that Protestants understand them? Is He schizophrenic? A liar? A contradicter of His own words? Did He change His mind in between verses 58 and 63? Amen, amen, I say to you, you seek Me not because you have seen miracles [He had just gotten done feeding the thousands with the five loaves], but because you did eat of the loaves and were filled. Labour not for the meat which perisheth, but for that which endureth unto life everlasting, which the Son of man will give you. The crowd then goes on to ask for manna -- and what did manna do? It physically kept the Israelites alive. It was a non-salvific, non-grace transmitting Heaven-sent bread given for physical sustenance. By saying to His disciples that the "Spirit gives life, the flesh profiteth nothing," He is not saying the His flesh is not meat indeed (which He DEFINITELY goes on to say); He is admonishing those who only want a bellyful and who think only carnally instead of seeing things spiritually and seeking life everlasting. He is admonishing those who care more for their earthly pleasures than heeding His words, "he that eateth of this bread shall live for ever." It was carnal to question how He came down from Heaven, to deem that He was the son of Joseph, to ask, 'How can he give us His flesh to eat?' All this was carnal, when they ought to have understood the matter in a mystical and spiritual sense. 'But,' saith some one, 'how could they understand what the 'eating flesh might mean?' Then it was their duty to wait for the proper time and enquire, and not to abandon Him. 'The words that I speak unto you, they are spirit and they are life.' That is, they are divine and spiritual, have nothing carnal about them, are not subject to the laws of physical consequence, but are free from any such necessity, are even set above the laws appointed for this world, and have also another and a different meaning. Now as it, this passage He said 'spirit,' instead of 'spiritual,' so when He speaketh of 'flesh,' He meant not 'carnal things,' but 'carnally hearing,' and alluding at the same time to them, because they ever desired carnal things when they ought to have desired spiritual. For if a man receives them carnally, he profits nothing. 'What then, is not His flesh, flesh?' Most certainly. 'How then saith He, that the flesh profiteth nothing?' He speaketh not of His own flesh, (God forbid!) but of those who received His words in a carnal manner. But what is 'understanding carnally'? It is looking merely to what is before our eyes, without imagining anything beyond. This is understanding carnally. But we must not judge thus by sight, but must look into all mysteries with the eyes within. This is seeing spiritually. He that eateth not His flesh, and drinketh not His blood, hath no life in him. How then doth 'the flesh profit nothing,' if without it we cannot live? Seest thou that the words, 'the flesh profiteth nothing,' are spoken not of His own flesh, but of carnal hearing? Ver. 64. 'But there are some of you that believe not.' Again, according to His custom, He addeth weight to His words, by foretelling what would come to pass, and by showing that He spake thus not from desire of honor from them, but because He cared for them. And when He said 'some,' He excepted the disciples. For at first He said, 'Ye have both seen Me, and believe not' (ver. 36); but here, 'There are some of you that believe not.' For He 'knew from the beginning who they were that believed not, and who should betray Him. But -- how can any of this be? We are the priesthood of believers! We can't possibly need some ordained priesthood to confect the Eucharist! Some people are so turned-off by the idea of there existing a religious hierarchy, any sort of authority, that they reject the idea of the necessity of an ordained priesthood out of hand. These sorts of people often go on negatively about "organized religion," talking about how they're "spiritual, but not religious" or, if Christian, about how all they need is their Bibles. Some Christians talk about "the priesthood of believers" and how such a "fraternity" renders the ordained priesthood unnecessary. This Old Testament-era nation of priests still had their Aaronic priesthood whose members were the only ones allowed to offer certain sacrifices. The Aaronic priesthood was based on genetic succession; it descended from Aaron, through his sons, and their sons after them. The priesthood of the New Covenant, having changed (Hebrews 7:11-12), is based on Apostolic succession. Every validly ordained Catholic priest has been made a priest by the laying on of hands: he has been ordained by a bishop who's been ordained by a bishop who's been ordained by a bishop...who, ultimately, going back two millennia, was ordained by the Apostles who were ordained by Christ. They [Korah and company] gathered together against Moses and Aaron, and said to them, "You take too much upon yourselves, for all the congregation is holy, every one of them, and the Lord is among them. Why then do you exalt yourselves above the assembly of the Lord?" Korah et al knew they were part of the common priesthood but wanted more: they wanted the powers of the ordained and got in Moses' face about it; in their pride, they were offended by the idea of a "priestly class." Moses challenged them to offer incense to God, as do the priests, the next day. They did. And they died. Jude has warned you -- in the New Testament, after the coming of our Lord Whom many believe didn't come to fulfill the Law but to destroy it. "Why, we're under a doctrine of Grace, and in Him there is neither male nor female and such as that, so that means hiearchy and 'religion' make no sense. All I need is my Bible and the Holy Spirit to interpret it for me; I don't need priests!" Not according to Jude. Not according to the very earliest Christians. Think about it. It's so sad, and so infuriating, that Catholics are accused of "worshipping bread." Yes, the Blessed Sacrament looks like bread and tastes like bread. If one were to walk into a traditional Catholic Mass (that is, a Mass offered according to pre-Vatican II rubrics), one might think Catholics are crazy as they kneel down when the priest holds up what looks like a "piece of bread" for them to adore. "Why, those Catholics are bread-worshippers! I guess that hunk of dough must be some serious "Wonder Bread" to those idiots, hahaha!" --- but the Creator of the Universe said that it is not bread but His very Flesh, which is meat indeed. What God Almighty, Who made the earth and the moon and stars says, is. Once God, through the priest, has changed the bread and wine into the Body and Blood, they should never, ever be referred to as "bread and wine"; they are the Body, Blood, Soul, and Divinity of Christ Jesus. In other words, we don't worship bread; we worship Christ! It takes the eyes of faith to "see" that the apparent mere bread and wine are truly the Body and Blood of Christ; it takes an intellectual assent to divine revelation, not emotional "feelings" (though one might experience tremendous emotion, too; I've wept out of sheer gratitude to my Savior for humbling Himself for me in such a way at the Mass!). Sometimes one might struggle to "feel" that what appears to be "bread" and "wine" are what He said they are, especially at many modern Masses during which the Body and Blood are so often treated with irreverence. The proper response to doubt, though, is, "Lord, I believe! Help Thou mine unbelief!" (Mark 9:24), not mockery. This is that bread which came down from heaven: not as your fathers did eat manna, and are dead: he that eateth of this bread shall live for ever... Many therefore of his disciples, when they had heard this, said, This is an hard saying; who can hear it?... From that time many of his disciples went back, and walked no more with him. 2 The Catholic Encyclopedia, 1917, in its entry for "Archaeology of the Cross and Crucifix," notes that microsopic analysis of relics of the Cross (taken to Rome by Constantine's mother, Helena) were found to be of pine; cedar is of the pine family. Cedar, too, is mentioned all throughout the Bible as a building material, including for the building of the Temple itself, and in more poetic terms, such as in Psalm 104:16-17 "The trees of the LORD are full of sap; the cedars of Lebanon, which he hath planted; Where the birds make their nests: as for the stork, the fir trees are her house." A part of the titulus -- the sign with the words "Jesus of Nazareth, King of the Jews" in Latin, Greek, and Hebrew -- that is kept in the Church of San Croce in Rome, is made of a type of walnut. The other half of the titulus was kept in Jerusalem, but was lost when Jerusalem, then Christian, was sacked by Jews and Persians in the 7th century. It may have survived that sacking as there is mention that it was seen at Sainte Chapelle in Paris, having been bought by King Louis IX (St. Louis) from Constantinople, where it was stored away after it was saved from the Jerusalem wreckage. If this is the case, that second half was destroyed during the French Revolution. And Melchizedek king of Salem [ie, Jerusalem] brought forth bread and wine: and he was the priest of the most high God. And he blessed him, and said, Blessed be Abram of the most high God, possessor of heaven and earth: And blessed be the most high God, which hath delivered thine enemies into thy hand. And he gave him tithes of all. And the LORD spake unto Moses and Aaron in the land of Egypt saying, This month shall be unto you the beginning of months: it shall be the first month of the year to you. Speak ye unto all the congregation of Israel, saying, In the tenth day of this month they shall take to them every man a lamb, according to the house of their fathers, a lamb for an house: And if the household be too little for the lamb, let him and his neighbour next unto his house take it according to the number of the souls; every man according to his eating shall make your count for the lamb. Your lamb shall be without blemish, a male of the first year: ye shall take it out from the sheep, or from the goats: And ye shall keep it up until the fourteenth day of the same month: and the whole assembly of the congregation of Israel shall kill it in the evening. And they shall take of the blood, and strike it on the two side posts and on the upper door post of the houses, wherein they shall eat it. And they shall eat the flesh in that night, roast with fire, and unleavened bread; and with bitter herbs they shall eat it. Eat not of it raw, nor sodden at all with water, but roast with fire; his head with his legs, and with the purtenance thereof. And ye shall let nothing of it remain until the morning; and that which remaineth of it until the morning ye shall burn with fire. And thus shall ye eat it; with your loins girded, your shoes on your feet, and your staff in your hand; and ye shall eat it in haste: it is the LORD's passover. For I will pass through the land of Egypt this night, and will smite all the firstborn in the land of Egypt, both man and beast; and against all the gods of Egypt I will execute judgment: I am the LORD. And the blood shall be to you for a token upon the houses where ye are: and when I see the blood, I will pass over you, and the plague shall not be upon you to destroy you, when I smite the land of Egypt. And this day shall be unto you for a memorial; and ye shall keep it a feast to the LORD throughout your generations; ye shall keep it a feast by an ordinance for ever. And ye shall offer that day when ye wave the sheaf an he lamb without blemish of the first year for a burnt offering unto the LORD. And the meat offering thereof shall be two tenth deals of fine flour mingled with oil, an offering made by fire unto the LORD for a sweet savour: and the drink offering thereof shall be of wine, the fourth part of an hin. Who is there even among you that would shut the doors for nought? neither do ye kindle fire on mine altar for nought. I have no pleasure in you, saith the Lord of hosts, neither will I accept an offering at your hand. For from the rising of the sun even unto the going down of the same my name shall be great among the Gentiles; and in every place incense shall be offered unto my name, and a PURE OFFERING: for my name shall be great among the heathen, saith the Lord of hosts. Then Jesus said unto them, Verily, verily, I say unto you, Moses gave you not that bread from heaven; but my Father giveth you the true bread from heaven. For the bread of God is he which cometh down from heaven, and giveth life unto the world. Then said they unto him, Lord, evermore give us this bread. And Jesus said unto them, I am the bread of life: he that cometh to me shall never hunger; and he that believeth on me shall never thirst. But I said unto you, That ye also have seen me, and believe not. I am the living bread which came down from heaven: if any man eat of this bread, he shall live for ever: and the bread that I will give is my flesh, which I will give for the life of the world. The Jews therefore strove among themselves, saying, How can this man give us his flesh to eat? Then Jesus said unto them, Verily, verily, I say unto you, Except ye eat the flesh of the Son of man, and drink his blood, ye have no life in you. Whoso eateth my flesh, and drinketh my blood, hath eternal life; and I will raise him up at the last day. For my flesh is meat indeed, and my blood is drink indeed. He that eateth my flesh, and drinketh my blood, dwelleth in me, and I in him. As the living Father hath sent me, and I live by the Father: so he that eateth me, even he shall live by me. This is that bread which came down from heaven: not as your fathers did eat manna, and are dead: he that eateth of this bread shall live for ever. These things said he in the synagogue, as he taught in Capernaum. Many therefore of his disciples, when they had heard this, said, This is an hard saying; who can hear it? When Jesus knew in himself that his disciples murmured at it, he said unto them, Doth this offend you? What and if ye shall see the Son of man ascend up where he was before? It is the spirit that quickeneth; the flesh profiteth nothing: the words that I speak unto you, they are spirit, and they are life. But there are some of you that believe not. For Jesus knew from the beginning who they were that believed not, and who should betray him. And he said, Therefore said I unto you, that no man can come unto me, except it were given unto him of my Father. From that time many of his disciples went back, and walked no more with him. Then said Jesus unto the twelve, Will ye also go away? Then Simon Peter answered him, Lord, to whom shall we go? thou hast the words of eternal life. And we believe and are sure that thou art that Christ, the Son of the living God. But this man, because he continueth ever, hath an unchangeable priesthood. Wherefore he is able also to save them to the uttermost that come unto God by him, seeing he ever liveth to make intercession for them. For such an high priest became us, who is holy, harmless, undefiled, separate from sinners, and made higher than the heavens; Who needeth not daily, as those high priests, to offer up sacrifice, first for his own sins, and then for the people's: for this he did once, when he offered up himself. For the law maketh men high priests which have infirmity; but the word of the oath, which was since the law, maketh the Son, who is consecrated for evermore. And I beheld, and, lo, in the midst of the throne and of the four beasts, and in the midst of the elders, stood a Lamb as it had been slain, having seven horns and seven eyes, which are the seven Spirits of God sent forth into all the earth. And he came and took the book out of the right hand of him that sat upon the throne. And when he had taken the book, the four beasts and four and twenty elders fell down before the Lamb, having every one of them harps, and golden vials full of odours, which are the prayers of saints.